Planning to put your house on the market ? Well, 2019 will be a promising year for the real estate industry, and it goes without saying that you are hoping to sell your home as quickly as possible! 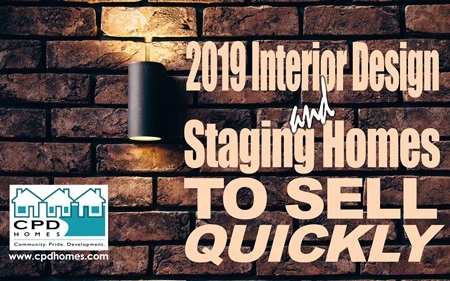 And in order to get your asking price possible, staging homes to sell quickly is a must for home sellers and developers alike! Staging your home before selling will give it a new and fresh look while utilizing what you already have and come up with a product which can sell at an even higher price than you had anticipated. Hiring an interior designing professional or stager will combine many aspects of your home like texture lighting and space, and give you an idea of how you can package your home to be as attractive as possible for a prospective buyer. Based on recent comparative study, non-staged homes sit on the market for an average of at least 3-4 months, while staged homes sell within 1-2 months. Staging homes to sell quickly, seller should aim to make a lasting first impression with their potential buyers. That first impression will be important, so make sure that the front room is spacious, clean and inviting. Simply stage the home with what resources you have, organize everything inside and outside of your home, and make sure to take care of any issues that need to be addressed. Interior Design for home staging can be as simple as organizing the interior and exterior of your home. Boost curb appeal. Power wash siding and walkways and hang easy-to-read house numbers. Plant blooming flowers and fresh greenery, mow lawn, and reseed or add fresh sod as needed. Wash front windows and repaint or stain the porch floor as needed. Welcome visitors with an inviting porch. Get your house sparkling clean. From shining floors and gleaming windows to clean counters and scrubbed grout, every surface should sparkle. Clear away all clutter and clean all surfaces, floors, cupboards and closets equal more space in the eyes of potential buyers, so purge anything unnecessary or unsightly. Style your dining room table, re-arrange your furniture and choose sophisticated neutral colors for the interior. Open those closets, clean up toys and use “extra” rooms wisely. At open-houses, entice people to explore the whole house by placing something that draws the eye at the top of the stairs, in hallways or in corners, you can pique curiosity and keep potential buyers interested throughout a whole home tour. 2019 Interior Design trends basically adopts what’s being shown, highlighted and post on social media. Therefore, create a lifestyle that people are looking for. Stage the outdoors too and think seasonally. Make sure your garden is in beautiful shape in the summer, and that any extra features you have, like a pool or a fire pit, are cleaned and ready to go. Take advantage of the cozy vibe of the season in autumn and winter, by building a fire in the fireplace and simmering hot apple cider on the stove. If you’re having trouble making decisions, remember to put yourself in the shoes of your possible buyers and staging homes to sell quickly will be as simple as it can be. Need to sell your house? We can help! Call us at CPD Homes at 216-282-4332 and let us make you an offer today!